In Independence, The Independence Hotel is under construction on a site overlooking a vast expanse of riverside parkland. When it met on Oct. 17, the advisory board of the Central Albany Revitalization Area talked about going ahead with some general push for redoing the riverfront. Seth Sherry, economic development director, said this would take a good deal of work to prepare buildable plans for public parks, street improvements, and private investment, along with delicate coordination with private developers. He thought something might be ready for construction in 2020. CARA has about $20 million left to spend before expiring, and Sherry guessed that the waterfront effort — with as many as 10 possible projects identified in the CARA work plan from 2001 — would take $15 million of that. He recommended that CARA stop various small-grant programs to conserve its finances for the riverfront task. Upstream of Albany, Corvallis revived its riverfront years ago, mainly with a linear park. 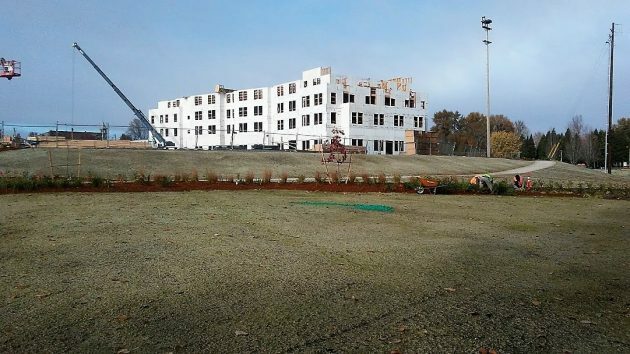 Downriver, Independence is doing so now with construction of a 75-room hotel overlooking a large landscaped area and wide-open park offering scenic views of the Willamette. In Independence, “The Independence Hotel” promises to open next summer. It’s intended for visitors to various events at nearby Western Oregon University and elsewhere, including wineries. It will also cater to bicycle tourists with a fully equipped bike repair room. 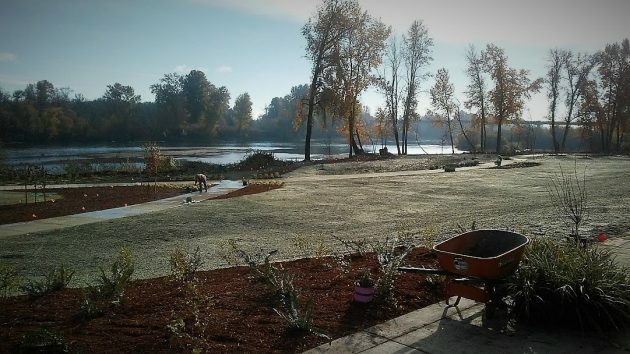 The grounds near The Independence Hotel offer a long view of the Willamette. HH, does CARA have an expiration date? This came up while Albany citizens were passing the voter approval measures (debt & urban renewal) several years ago. I don’t think we ever got a clear answer from the City. The CARA Plan identifies a maximum indebtedness amount ($56,000,000). But the Plan appears to be fuzzy about an actual termination date. It is “estimated” and “anticipated” that CARA will stop skimming tax revenues from the other taxing districts in 2026-2027. Is it possible that CARA could go on indefinitely until the $56,000,000 debt limit is reached? Is the debt limit considered a hard stop or is that squishy too? Yes, $56M is the “hard stop.” Always has been. We could have been there years ago if we had had the political will to follow the plan. When we reach the $56M, the paying-back is the end-game. Currently, it’s running ~$3.5M per year in TIF income. Ray, thanks for clarifying that there is no end to CARA until they reach the debt limit of $56,000,000. And, even though you conveniently neglected to mention it, thanks for reminding us that the Corvallis charter gives their voters the final word on urban renewal plans. Their south Corvallis plan is scheduled to go before the voters next March. Which reminds me…..CARA never received voter approval in 2001. And several years ago you, the Mayor, and most of the city council opposed having Albany voters be the final say on future urban renewal plans. Thankfully, Albany voters saw through your asininity and put voter approval in the city charter. In retrospect, doesn’t your opposition to voter approval strike you as rather arrogant? Yes – Corvallis voters will ascribe to the URD. Any bets on it? As far as ours is concerned, your elected representatives made that decision many years ago. It’s called elections that determine the outcome. They happened. You just don’t happen to agree with the decision they subsequently made. It’s no different than my considering the “asininity” of electorate voting for future URDs. Gordon, you say “we”, from what I’ve seen you are not a local citizen/tax payer. Is that correct? Happy to see development of the river front getting some traction, if you ever want to revive the downtown area it will certainly be necessary. Unfortunately Albany has those dang railroad tracks that run right through downtown. Unless anything is ever done with those, nothing worth a darn will ever happen down there. Why don’t they do something about those tracks? I’d sure like to see them go away! Roman’s comments are spot on. All one needs to do is drive Water Ave through the two jammed intersections by The Wheelhouse and Calapooia Brewing to know. Especially the one by Calapooia as delivery trucks park in the yellow zones. What about the thousands of dollars paid to George Crandall for his designs? What is the line work going on between Main and Geary on Water Ave this week? I hope the city of Albany may consider putting back the Dave Clark foot Bridge. Since they are putting in a new Hotel so close by. It would be so nice having that bridge put back in. Maybe this wasn’t clear: The hotel shown with this story is under construction in Independence, not Albany. But I agree that that footbridge Dave Clark had built across the Calapooia, destroyed by flooding in 1996, should be rebuilt. This is a great initiative. But to revitalize downtown Albany also needs more density. Yes!, density!. Less parking lots (people always complaining about parking, at the end they’d like to have a massive parking lot with nothing to do or see), more mixed-zoning with nice western-style apartment buildings and brick and mortar stores. Does every bank downtown needs a specific parking lot? Can’t we build a common parking building like in downtown Salem and liberate so much land to build much needed apartments? Downtown will only be appealing if you actually have people LIVING downtown. Remember YIMBY: Yes in my Backyard! More houses, more density, end the tyranny of zoning! End sprawl! Make a livable city for everyone, not only homeowners.